Bloodshot USA issue #3 could be Bloodshot’s last chance to prevent the airborne nanite virus from taking hold of New York City. 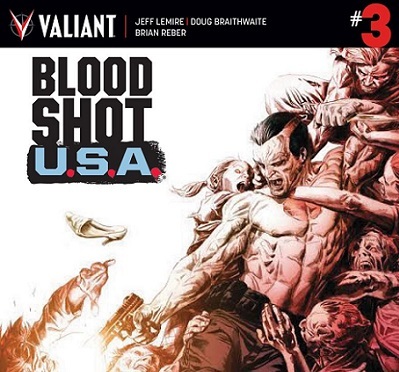 This stand alone saga from writer Jeff Lemire and Doug Braithwaite is delivering plenty of Bloodshot in the thick of the action. For those planning on following the Kommandar Bloodshot series in the Stalinverse, which is beginning this December, the Bloodshot USA series will be worth reading. In the previous episodes, the escape of Project Rising Spirit’s latest experiment in weapons technology into the world has left the real proposition of New York’s inhabitants transforming into zombie-esque, crazed killers. Bloodshot and Deathmate are standing in the way, the last chance remaining to rescue the city. Lemire and Braithwaite are helming a quality series. Bloodshot is always a fascinating character and it’s great that so many different interpretations of Bloodshot are available. Bloodshot USA will be published by Valiant Comics on December 21st.